Joseph Avenue's arts and cultural scene continues to grow with the recent opening of The Avenue Blackbox Theatre, a new venue in a stand-alone building at 780 Joseph Avenue that formerly housed Your Local Pharmacy. 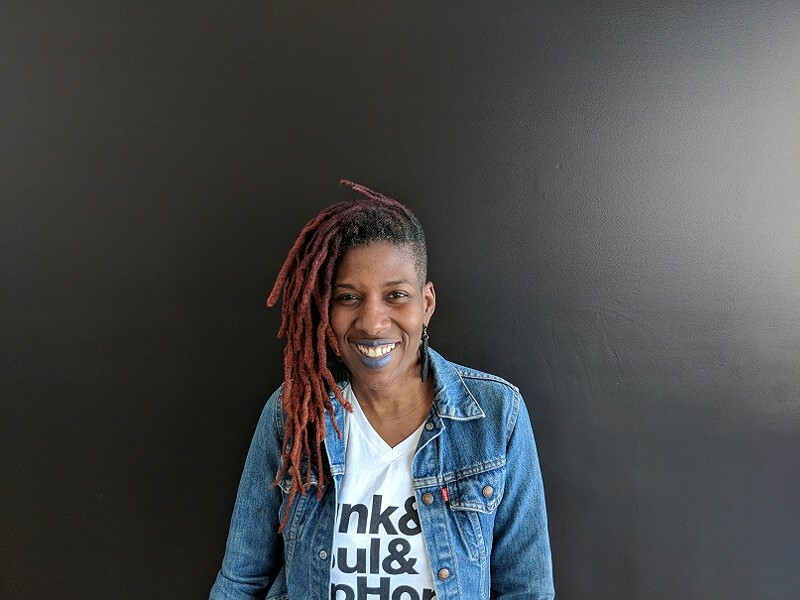 At the helm is Rochester-based artist, writer, and performer Reenah Oshun Golden, who says her vision has been to create a community theater that serves the Joseph Avenue neighborhood and incorporates the "culture that already exists here, not just imposing something on the space, but actually allowing the community to be a part of it." The space is already hosting theatrical and multimedia performances as well as programming for children. Golden anticipates being ready to launch a full, premiere season in the fall, but says that the space will keep offering programming throughout the summer. Until then, renovations will keep rolling out in segments that won't interfere with the performances. The Avenue is partnered with the Joseph Avenue Arts and Culture Alliance, which has been working to fund arts along Joseph Avenue, and use the arts to beautify the neighborhood. The alliance purchased the synagogue down the street, which is being developed into a performing arts center as well. Reenah Oshun Golden has opened The Avenue Blackbox Theatre, a community venue on Joseph Avenue. "The patrons of the arts in Rochester don't necessarily reflect all of what Rochester's population is," she says. "Mostly that's because people get priced out at the door." Golden's previous efforts to manifest her vision for this neighborhood theater and community space began at PUC Achieve Charter School off of Hudson Avenue, where she helped build a theater. But when the school's new administration came through the momentum didn't last. She moved out of that space last July, and began looking for another space. "I didn't want to go to the Neighborhood of the Arts, or the East End to create something like this," Golden says, adding that the 14621 neighborhood needs more cultural programming. The opportunity on Joseph Avenue arose in early fall 2017 through a connection with Annette Ramos, who Golden has worked with creatively for years, and who is on the board of the Joseph Avenue Arts and Culture Alliance. Golden's first walk through of the current space was in November. The more than 2,000 square-foot space's capacity is 72 seats, with the audience facing a white staging wall and with its back to the opposite wall's large windows. "We're a black box with a white wall," Golden says. "We can do projection, multimedia, and multidisciplinary stuff, the type of work I like to do and want to curate in the space." At the moment the stage is a floor-level instead of elevated, but the team is designing a custom sprung floor "so it's more comfortable for performers and especially dancers," Golden says. The space will also feature some movable walls — to be designed by kids in the STEAM program overseen by Gary Dewitt Marshall at Vertus High School and mentees of Exploration Charter School's Anthony Chipre — which will allow different compartmentalizing of the space. Handy friends have helped renovate the space, Golden says. The bones of the theater are complete, with a box office, lobby, and gallery. Golden is also working with architect Rich Rosen, who is volunteering his time to design ways to use the upper spaces of the lofty theater to install lighting and sound apparatuses, a recording booth, and storage space for props and sets. Dressing rooms and a new bathroom are also in the works. Home Depot donated almost all of the paint the space needed. What was the central pharmacy area of the former store will house a community room that will host workshops, a smart classroom for youth, readings, community meetings, a literacy center, and a concessions area during shows. In early June the venue held a four-day Ribbon Cutting and Grand Opening Weekend, with both free and ticketed events that included live community art making, music, theatrical performances, a gallery exhibit opening, and a parade with interactive storytelling featuring Annette Ramos and Rochester Latino Theatre Company, which is The Avenue's first resident group. Other resident groups include More Than Rebel Noise and Breathing Fire Teen Poetry Slam. The Avenue is also working with Avenue Children's Theatre Project, which is free theater for children. "Kids will never have to pay to come to see a show, or get involved in acting classes," Golden says. The space will host travelling shows as well. Golden says she's got tons of national and international connections, and has begun talking to friends about connecting with the space. "One of my partnering organizations on the national level is The Living Word Project run by Marc Bamuthi Joseph, who is the artistic director of Yerba Buena Center for the Arts in San Francisco," Golden says. "And they have amazing touring productions that include some of the young poets we've both worked with over the years. I'm just so excited -- I've already had one of them in town as a resident for some of the community work I was doing." Fundraising is ongoing -- Golden is writing grants and seeking new opportunities for partnerships with foundations and private donors, and there's a crowdsource fundraiser going on. Additionally, she says the goal is to have the subscription base of the theater come predominately from the 14621 and 14605 neighborhoods. "My vision is the idea that theater shouldn't just be for folks who have disposable income, who can afford theater," Golden says. "So the idea of underwriting for this space really has to take into consideration that 60 to 70 percent of our subscription base -- they didn't pay for the subscription. Their address makes them a member of the theater. I want the seats full every time, and to have that not be contingent upon whether or not people can afford the show."